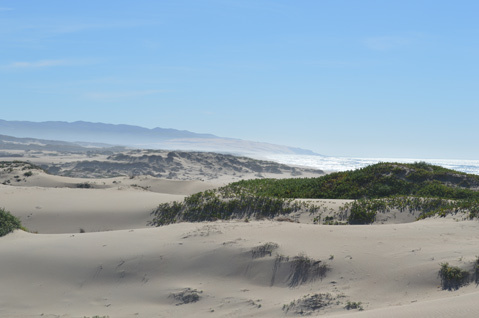 Time passes differently on the vast, windswept Guadalupe-Nipomo Dunes. The 22,000 acres of ocean-side dunes, rolling for 18 miles from Point Sal in northern Santa Barbara County all the way to Pismo Beach, shelter a dramatic sandscape seemingly cut off from the rest of the world. Near the small farming town of Guadalupe, itself a time capsule, the remote dunes make for a great destination for families, fishers, birdwatchers, and avid hikers alike to happily lose time. 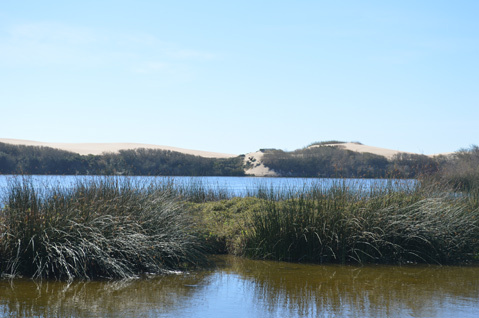 Daytrippers could consider a trip to Oso Flaco Lake, an easy walk featuring a unique coastal ecosystem. This wheelchair-accessible boardwalk trail requires a $5 parking fee and is open from sunrise to sunset. The trip begins with a passage paralleling Oso Flaco Creek and takes you beneath a sheltering corridor of arroyo willows and wax myrtles bedecked with Spanish moss. The causeway continues to a fork, with the eastward route leading upward to the Oceano Dunes SVRA, where big trucks and ATVs look small upon the vast stretch of sand. A sign tells of mountain lions, known to roam the area. The trail continues west across a bridge over Oso Flaco Lake. A rare kind of freshwater environment, the lake was formed after a channel of the Santa Maria River changed course in the 1860s. The lake is a great place to view wildlife, especially birds; over 80 species of birds have been recorded in the dunes complex. Just off the trail, ruddy ducks and coots dive and dart beneath the boardwalk, white pelicans sail, and herons stalk the tules and bulrush. Walkers can turn around at the end of the lake, or continue a little ways farther, where the boardwalk goes slightly uphill before ending, naturally, at the beach. A raised platform affords expansive views of the dunes and the entire San Luis Bay. To the far south, the dunes reach their highest point near Mussel Rock, towering at 500 feet — the highest beach dunes in the western United States. For most, the journey ends where the boardwalk does, and a great day on the beach awaits. However, keep going south to find further seclusion and enjoy the more distant dunes. Wildlife abounds in the region south of the lake, a National Wildlife Refuge where one may witness pelicans, plovers, falcons, or turkey vultures. Exploring the dunes, endangered plant life can be found nestled amidst ancient habitation, as Chumash shell middens carpet the ridges and ravines of sand. The Chumash lived in this area for thousands of years, settling in huts made from willow branches and tule reeds. The dunes have been stage for all manner of colorful human activity. In the 1930s and ’40s, the dunes were home to the Dunites — a clan of artists and mystics who resided in a private spiritual utopia. The dunes also has played home to many movie sets, including Cecil B. DeMille’s The Ten Commandments, the biggest movie of its time. The 1,600-hand crew built and subsequently left behind huge pharoahs and sphinxes, which the migrant sands eventually swallowed whole. Pieces of the giant plaster molds were very recently recovered and are on display at the Dunes Center in Guadalupe, worth a visit on the way to or from the dunes. But sitting in the stillness of the dunes, one feels a sense of endless time, of many thousands of years of quiet despite human intervention. An hour spent in the remote dunes may feel like another lifetime on the walk back. It’s a rare feeling, one made rarer still by encroaching forces. Signs make note of dwindling tern and plover populations and fish wearing pesticide runoff from nearby agriculture. Time has taken its toll on the fragile ecosystem which human development will no doubt continue to influence. Only time will tell if the ever-shifting dunes dissolve or, moving inland from swelling seas, make disappearing movie sets out of our neighboring civilization. Until then, it’s a beautiful and rare place, a great one to spend an hour, a few, a day — out there, it’s easy to lose count.